Steam rises from Wall Street sewers like hot breath from a pack of wild dogs. Just below the pavement's puddle strewn surface, the Teenage Mutant Ninja turtles(r) have gathered around the leftovers of a family-reunion-sized sausage pizza with extra sausage. Usually these party dudes would inhale the mozzarella platter as if it were the last "za" on earth, but not tonight. You see, only hours ago, their trusted friend, April(tm), was kidnapped from her mobile news van by the vile, ruthless, terrorist bully SHREDDER(tm)! He's a Slice-O-Matic crum, a villain more vicious than an army of mind altered Bruce Lees. With their lovely cohort held hostage, the fearless foursome must concoct a way to rescue April before Shredder brain washes her into joining his Ninjitsu Foot Clan. They'll combine this treacherous task with the mission they've had since their mutated beginnings - to thrash Shredder and capture his Life Transformer Gun, the lone piece of technology that can turn their rat friend, Splinter(tm), back into the man he used to be. So take control of these heroes in a half shell, and either claim total victory over New York's premier Kick Man... or lead them onto the menu at McTurtles (Home of the Quarter Flounder with Cheese). --From the NES Teenage Mutant Ninja Turtles instruction manual. 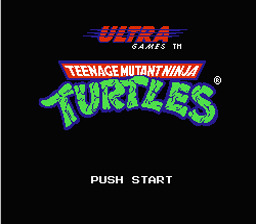 Play Teenage Mutant Ninja Turtles Now! You'll start out as Leonardo, but you can change to any other turtle by pressing start and selecting another turtle from the menu. Donatello - Donatello does machines, his Bo has the longest range, and can hit enemies behind him. Raphael - Raphael is cool but rude, his sais are short range but they come out fast. Michelangelo - Michelangelo's a party dude, a lot like Leonardo. A middle character. There are three types of game areas. OverWorld: This is the area that has the top down view. You can use your basic attacks to stop any foot soldiers that try to stop you. Watch out for the steam rollers thought because they kill you instantly. Battle stages: Here you've got your full arsenal. Enemies swarm and you'll wish the control was more responsive. Underwater stages: Tap A to swim up, tap B to swim down. Avoid the electrical barriers and defuse the bombs. Watch out! You've got a time limit! The boomerang. Get it and keep it. The boomerang is your best friend. As long as you catch it you have infinite ammo.